Well, that didn't take long. 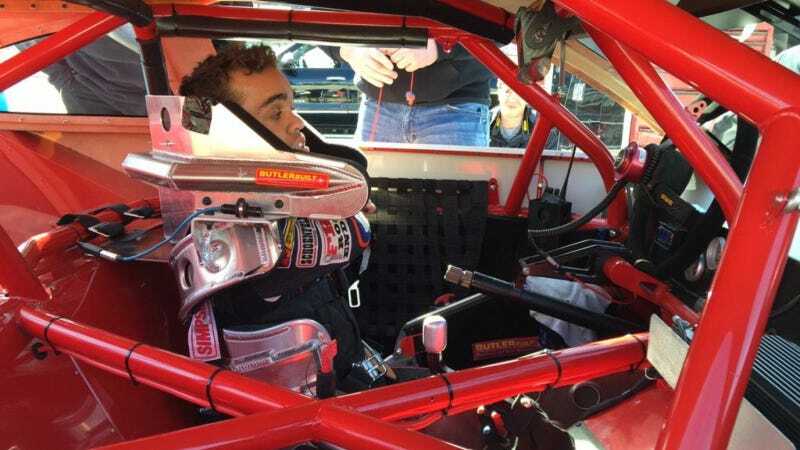 We mentioned that Chili Bowl winner Rico Abreu would be going places, and lo and behold, Abreu announced today that he will be driving for HScott Motorsports with Justin Marks for the NASCAR K&N Pro East series. All modifications are really simple, nothing way off radar, and it's really safe. My whole goal was going to New Smyrna and getting laps and making sure I'm comfortable in the race car. You have to be 100 percent in these race cars, and you can't lose concentration about being uncomfortable. That's my biggest thing this weekend is being in the comfort zone, making sure everything is right and getting as many laps as I can. The pedals are mounted right underneath the dashboard, and it's moved closer to reach electronics. You look at the cockpit, and it's hard to tell the difference. The only difference is sitting a lot closer, and the pedals are closer. The adjustments aren't that bad. NASCAR came and said everything looks safe. Monday may have been the first time he ever sat in a stock car, but he's determined to keep winning in the K&N Pro Series East. According to NASCAR's write-up of the signing, Abreu plans to compete in the full fourteen-race season with teammates William Byron, J.J. Haley, Scott Deckert and Dalton Sargeant. HScott Motorsports with Justin Marks is a new team for this year, but looks promising. Not only are they fielding a lot of cars, but the two owners bring a lot of experience to the team. Team co-owner Justin Marks also drives in NASCAR and co-owns a World of Outlaws Sprint Car team. The other co-owner, Harry Scott, Jr., has teams in both the Sprint Cup and Xfinity Series. I smell a ladder to move up. "Rico is a driver that has already proven to himself on so many levels in his young career," said Marks to NASCAR. "I can't wait to see what Rico and his fellow teammates accomplish this year in the NASCAR K&N Pro Series East." Abreu plans to keep racing sprint cars and elsewhere, because why not? Fellow Californian and Chip Ganassi racing driver Kyle Larson has been a big mentor to Abreu over the years, and has reportedly offered to shuttle Abreu back and forth between Dover, Del., and Mechanicsburg, Pa. so that he can do a K&N Series and a sprint car race on the same wekeend, according to NBC Sports. When I grew up, I played sports, wrestled in middle school, then all my friends and classmates outgrew me, and I was limited to what I could do. I became a big race fan. I didn't even think I could race until I did it for the first time let alone be competitive so quickly in my career. It's just so cool to see that people really believe in you and like to see you achieve. A lot of people believe in me, and it gives me a lot of confidence and humbled me. I'm glad people can see who I am. They don't judge me for what I look like or why I'm doing it. I'm doing it because I'm a racer and love the sport. The first race of the K&N Pro Series East is on February 15 at New Smyrna Speedway.